Little, Brown and Company, 9780316509824, 288pp. Internationally renowned dermatologist and research scientist Dr. Whitney Bowe presents, for the first time, the connection between a healthy gut and radiant, clear skin, with a 21-day program to maximize skin health and beauty. Every year, nearly 80 million Americans will consult their doctors about their skin. In fact, skin disorders beat out anxiety, depression, back pain, and diabetes as the number one reason Americans see their doctors. Unfortunately, however, the vast majority will receive only a surface-level treatment, leaving the underlying conditions at the root of their skin issues unresolved. Skin doesn't lie; it reflects overall health in unimaginable ways. 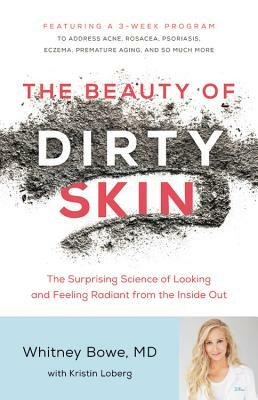 In The Beauty of Dirty Skin, internationally renowned dermatologist and scientist Dr. Whitney Bowe shows readers that skin health is much more than skin deep. As a pioneering researcher on the cutting edge of the gut-brain-skin axis, she explains how the spectrum of skin disorders -- from stubborn acne and rosacea to psoriasis, eczema, and premature wrinkling -- are manifestations of irregularities rooted in the gut. Lasers, scalpels, creams, and prescription pads alone will not guarantee the consistently healthy, glowing skin we all seek. Instead, Dr. Bowe focuses on the microbiome -- where trillions of microbes "speak" to your skin via the brain -- and highlights the connection between sleep, stress, diet, gastrointestinal health, and the health of your skin. With simple explanations of the science, do-it-yourself practical skincare strategies, and a life-changing 21-day program, The Beauty of Dirty Skin is your roadmap to great skin from the inside out and the outside in. Dr. Whitney Bowe is Medical Director of Integrative Dermatology, Aesthetics & Wellness at Advanced Dermatology, P.C., in addition to being a distinguished research scientist and a thought leader in her field. She is one of the most in-demand dermatologists in America, and has lent her expertise to programs like Good Morning America, The Rachael Ray Show, The Doctors, and Dr. Oz, and publications including The Wall Street Journal, the New York Times, Allure, InStyle, Vogue, Elle, Reader's Digest, and O, The Oprah Magazine. "A must-read for anyone who is struggling with skin issues and wants to address the root cause of the problem. In her book, Dr. Bowe compiles the latest medical science then gives a step-by-step guide to overcome any skin condition with diet, supplements, and natural skin remedies. If you want to heal your skin quickly and get lasting results, this is the book for you." "If you've ever stressed about a recurring pimple or a forehead wrinkle you fear is there to stay, dermatologist and research scientist Dr. Bowe's first book is chock-full of (digestible) science and tips for maximizing skin health." "The Beauty of Dirty Skin by leading dermatologist Dr. Whitney Bowe is a must-read for anyone looking to slow down the aging process and improve their skin's appearance. Not only will you learn which foods, actions, and products may be impeding your skin care, but more importantly, you will learn why." "I think this book is an important read for anyone suffering from skin conditions and considering medication. If you are interested in eating right, not over-cleansing your skin and having fantastic results, this is the book for you. Dr. Bowe has the science to back it up."